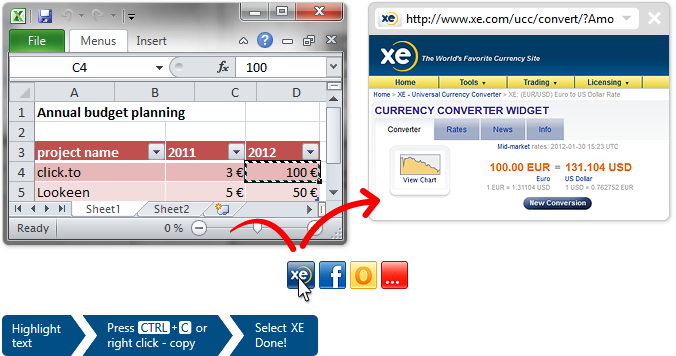 With click.to XE you can calculate currencies quickly. No matter where you currently are on your desktop. Your English colleague would like to know immediately how much the next project will cost the company. From the final estimate you can use “click.to XE” to compute all of the figures and get up-to-date equivalents in $, ₤, or Hong Kong dollars: Simply highlight the sum you want to calculate, copy with CTRL + C and click the XE icon that appears above your mouse cursor. Click.to automatically opens your browser, opens the online XE service, and enters your search number to show the final results. Save yourself some time by using the fastest way to convert your currencies – with click.to.